How do you endure the summer heat in Taiwan? Like in Japan, ice cream and shaved ice are very popular in Taiwan. In Japan there are many vending machines, but in Taiwan you can see at every corner shops selling drinks such as tapioca milk tea or other kinds of tea. At convenience stores you can buy dorayaki-like pancake with ice cream inside and other sweets. Taiwanese shaved ice is also very famous! In Japan there is sweet syrup poured on the top. In Taiwan, there are very different types of toppings such as tapioca, nata de coco or mung beans. Usually, you can choose your four favorite toppings and order that. It is the same 120 yen as in Japan. Isn’t it cheap? Also in Taiwan we have air conditioning and it is quite cool indoors. It is so cool that my friend from Hokkaido visited Taiwan and was wearing a light jacket in the room. And in Taiwan it snows in the winter, although only on high mountains. Tell me about your home town. My home town is Takao, but I moved to Taipei when I was a 5 year elementary student. Since then I had lived in Taipei until I came to Hiroshima. Many people think that Mt. Fuji is the typical landscape of Japan. Sceneries representing Taiwan are Mount Yu Shan (the highest mountain in Taiwan, even higher than Mt. Fuji. It was called “Niitakayama” during the Japanese occupation), Alishan (a mountain famous for its sunrise and the cypress wood industry), the Sun Moon Lake (the biggest lake in Taiwan), Taroko Gorge (a breathtaking precipitous cliffs situated near the east coast of Taiwan) and the bustling night markets (night stalls) and the friendly people! That’s what the image of Taiwan is consisting of. There are many stalls offering food at the night markets, just like Japanese summer festivals, but they are operating every day. They start at 4 or 5 in the evening and serve food until about 1 a.m. One of the most popular stalls is that of smelly tofu. Japanese people may not like it because of the smell. But you should try it. It’s delicious! I have studied Japanese language for 4 years at a university in Taiwan. But I wanted to come to Japan directly and experience the Japanese life, to learn things not written in the textbook. After graduation I worked for 3 years in the tourism sector continuing my studies for taking the exams for Japanese university admission. I succeeded after failing twice and could finally come to Japan in April of last year. The reason for my interest in Japan was my first trip abroad, to Okinawa. The weather in Okinawa is very similar to Taiwan, but the people in Okinawa talk Japanese. That was very interesting for me. Furthermore, I was influenced by the Japanese anime I saw when I was a child. What kind of work did you do in Taiwan? I was a tour conductor and a sales representative. As a tour conductor my work was to take Taiwanese tourists abroad. Our destinations were Thailand and Malaysia, regions in South East Asia. I used English and Chinese, but had almost no opportunity to speak Japanese. Considering my plan to study in Japan, I started another job in a travel office with mainly Japanese clients, so I could take advantage of my Japanese language ability. My work was to guide Japanese tourists visiting Taiwan. All of the Japanese tourists were polite and kind. Even now, I am still in contact with people I became friends with at that time. So they must have been very happy when they heard that you will come to Japan for studying. Yes, one of them is an 85 years old lady. We have exchanged letters several times, and when I went to Tokyo in last March I could stay at her house. It was in Kanagawa Prefecture, and from her house, I could see Mt. Fuji, which looked very small from the distance! That sounds great. But haven’t you been homesick when you came to Japan? That was no problem. I quickly got used to the life in Japan. I am living in a dormitory, and there are many international students but also some Japanese undergraduate students and all of us became friends easily. We sometimes enjoy cooking together. Please tell me something about your major. My major is tourism. Specifically I study the basics of tourism and anthropogeography. I am interested in touristic promotion and town planning, and I am studying local development. In addition, I attend lectures about regional investigation and help seniors with surveys. I visit many regions (Shimanami Kaido Expressway, Toyooka City in Hyogo Prefecture, San'in Kaigan Global Geopark etc.) and make questionnaire investigations on tourists and on the local population. That’s how I learned the technics of questionnaire surveys and interviewing. These activities help me obtain deeper understanding of these regions and these studies are very meaningful and interesting. I love my major. What is your impression of lectures at Hiroshima University? Hm. Lessons in Japan are longer than in Taiwan (where we have 10 minutes of rest after a lecture of 50 minutes). They are very effective, but it is difficult to sit concentrated. In addition, there are core subjects we have to take at the M1 (first grade of the master’s course) of the Graduate School of Integrated Arts and Sciences. We have to split into groups of 6-7 students and to cooperate writing a report. My group consists of me from Taiwan and two Chinese and three Japanese students. My impression is that Japanese students discuss very fervently about details. Some days ago, when we revised our power point presentation materials, the Japanese students were talking endlessly about the previous day’s contents of the lecture and we international students couldn’t follow them. Japanese students and international students may have a different way of setting priorities. There are many discussions in this lecture, but we are always studying in the same groups, so difference of opinion sometimes leads to a hot debate. But we try to overcome these differences. Then it’s O.K. Of course we don’t argue all the time, we also praise each other. (laugh) We also make presentations of our study results. We make the presentation in Japanese but in case of an audience who understands only English, we speak in English. 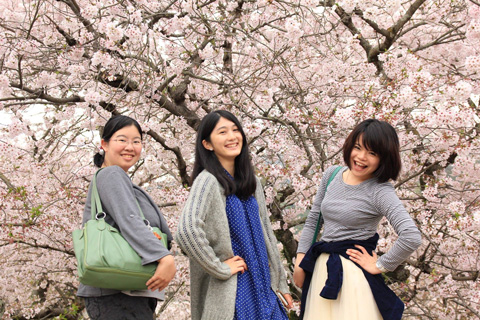 Do you have many opportunities to study together with Japanese students? Not so many. In my seminar room there are very few Japanese students. Last year, our teacher was a German and all of the students were international students from Korea, Nigeria, Vietnam, China and Taiwan. This year in April, it was the first time that a Japanese student joined us. She has many experiences of studying abroad and her presentations are of a very high level. I also receive a lot of inspiration. How will you take advantage of your studies in future? After I will have finished my studies in Japan, I will return to Taiwan and I want to work in the tourism industry, hopefully in the Tourism Bureau. You are the representative of the Taiwanese Student Association of Hiroshima University, aren’t you? Yes, we have around 15 members. One of them is already teacher at the Faculty of Education. As part of our activities, we went to the Kintai-kyo Bridge for flower viewing in April with a company president who is supporting us a lot. This spring, we welcomed three new members and celebrated that. We also take part in activities of the Lions Club and the local “walking our town” event. Other than that, we enjoyed hill climbing and barbeque with the people from a local newspaper, and of course, attended the Yukata Festival held last Sunday. We also help each other in daily life. For example, when a new student comes from a partner university of HU (in the case of Taiwan, it is the National Central University or National Chengchi University etc. ), our seniors inform us, that “A junior will come soon!” and that student will join the secret group of our Facebook and we can exchange information. But in case of a student with no seniors in a partner university it becomes more difficult to contact him/her. For example, one of my friends, a Chinese student discovered a Taiwanese student in her English class in May. This student had never heard about our association. And there was another student from the Faculty of Dentistry at Kasumi Campus who found us by chance on Facebook and then took contact with us. Like this, some members join us irregularly. We exchange information by LINE or our exclusive group on Facebook. It’s good to be able to keep in touch frequently, isn’t it? That’s right. For example, there was a HUSA-student (student of the Hiroshima University Study Abroad Program) who was determined not to return home until she completes her one-year program. Then she became terribly homesick and returned for a while. But after she “recharged energy” in Taiwan, she came back to Hiroshima (laugh)! Taiwan and Japan are very close, so you can buy a ticket any time and travel home. It is important that you are not too patient, isn’t it? By the way, what do you do in your leisure? Meeting friends, travelling etc. We have visited Tokyo, Hokkaido, Okinawa, Matsuyama Onsen and Kinosaki Onsen hotsprings. One of the greatest pleasures of Kinosaki Onsen is the “external hot spring baths”. Even when a guest house has its own hot spring facility, we love going out strolling along the streets wearing yukatas. I love this atmosphere of hot spring villages. Do you have an advice for juniors who are thinking of studying abroad? 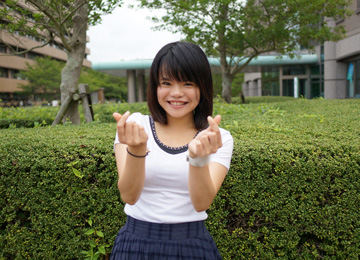 People in Hiroshima are very friendly and they are also kind to international students. For example, there is the Hiroshima Support Center for International Students in Hiroshima City which supports international students in Hiroshima Prefecture and also holds employment seminars. I think that Hiroshima Prefecture is very actively accepting foreign students. It’s a nice environment, and I really suggest my juniors to come here. And as preparation for studying abroad, I recommend you to study some Japanese. Is there something they should bring with them from Taiwan? That’s very individual. In my case, I brought a lot of Taiwanese seasonings with me. Soy sauce paste, sha cha jiang, sweet chili sauce and other ingredients difficult to find in Japan. Do you have also other dreams than working in the tourism industry? Of course! Within the three years I am in Japan I want to visit all of the 47 prefectures of Japan. Next month, on August 7th, I plan to go to the Great Fireworks Festival at Lake Biwa. So I can complete Shiga Prefecture, can’t I (laugh)? Like this, I want to visit every prefecture, at least one location. Is there any message of your teacher you take to heart? I was told that I should “be strict against myself now to be nice to me in future”. It means that someday I will be able to proudly claim that my work was worth the effort. Hard words but full of love! Is there anything you want to say in the end? When I came to Japan, I didn’t experience something like a culture shock, but some international students feel very lonely. I think even that belongs to our young life. When you can overcome that feeling and find friends and continue to try hard, the day will come, when you are thankful that you could have such experiences. Studying abroad is a very precious period in a person’s life, and it is important to overcome pain and loneliness by one’s own efforts. Absorbing all of these experiences will be an important power for your future life. - Let’s do our best together! 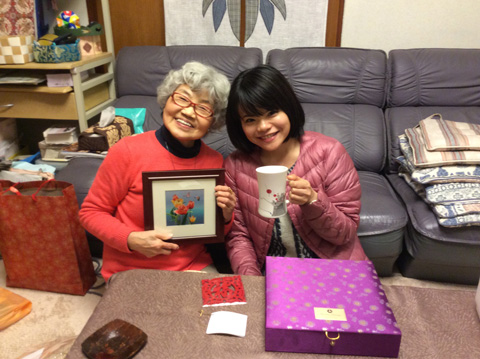 With souvenirs from Taiwan, I visited an 85 year old friend who lives in Odawara. I spent two nights at her house with a nice view of Mt. Fuji. Flower viewing picnic at the Kintaikyo Bridge. The cherry blossoms were in full bloom! We spent one night at a traditional Japanese house (kominka) in Shiwabori (Higashihiroshima City) to see the glow of fireflies. Last March we went on a field trip to Tottori. 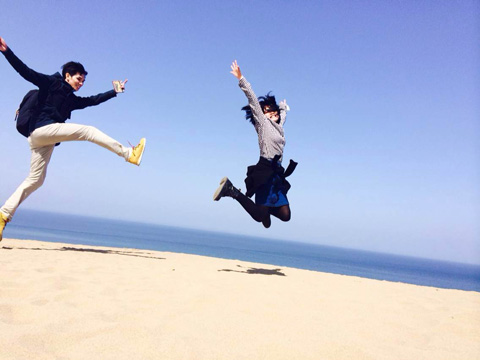 This dynamic photo was taken in the Tottori sand dunes!